Rick starts by reminding us of the biblical story of Abraham and his two sons, Isaac and Ishmael. Isaac’s descendents were the Israelites; Ishmael’s descendents, the Arabs. These two ethnic groups, both of which has a historical claim to the land along the eastern end of the Mediterranean, eventually gave rise to three different religions: Judaism, Islam, and Christianity. The land suffered numerous conquests: Assyrian, Babylonian, Persian, Greek, Roman, Byzantine, Christian Crusaders, and Ottoman. The Jews were expelled from the area during the Roman era, starting in the year 70. While a few Jews continued to inhabit the Holy Land, the majority of the population was Arab. The land was known as Palestine (from the Latin for “land of the Philistines”). When the Ottomans were defeated in World War I, the British took control of Palestine. The Zionist movement, born in the late nineteenth century, led to a trickle of Jewish immigration. In 1948, the modern state of Israel was established, and the trickle became a flood. As Jews returned to build their nation, hundreds of thousands of Palestinians were displaced. And to this day, both peoples struggle to find an equitable and peaceful way to share what they each consider their rightful homeland. Of course, the struggle has not always been equitable or peaceful. Extremists on both sides have done their part to undermine the peace. Today their are six million Jews in Israel, and about 1.2 million Palestinians, most of whom are Muslim. By law they have the full rights of citizenship, but many feel they are treated as second‐class citizens. Rick struggled with nomenclature in producing his TV show: what to call the land of the Palestinians. “The West Bank” (because it is the area just west of the Jordan River) is one commonly used term. But he settled on “Palestine,” which is the term used by the United Nations. They have granted the Palestinian authority “non‐member observer state” status. The city of Jerusalem is a study in contrasts. The modern city, according to Rick, would make Americans feel right at home. Its streets are lined with strip malls, hotels, restaurants, office buildings, apartments, and single‐family homes. The Old City is a tangle of cobblestone paths and streets, markets and small shops, churches and mosques. 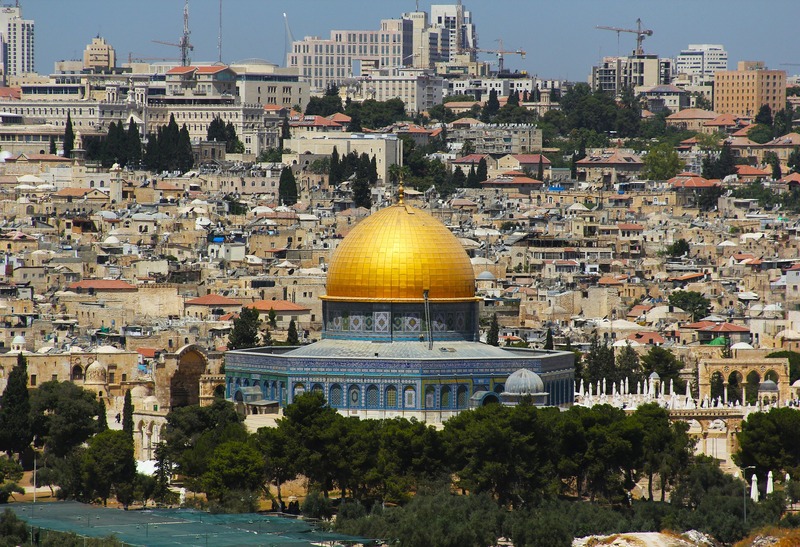 Holy places fill the Old City: Temple Mount, where the Dome of the Rock stands above the spot where Abraham nearly sacrificed his son Isaac and where Muhammad departed on his journey to heaven. This is also the site of the Temple of David. It is just a ten‐minute walk from here to the Church of the Holy Sepulchre, on the site where Jesus was crucified. 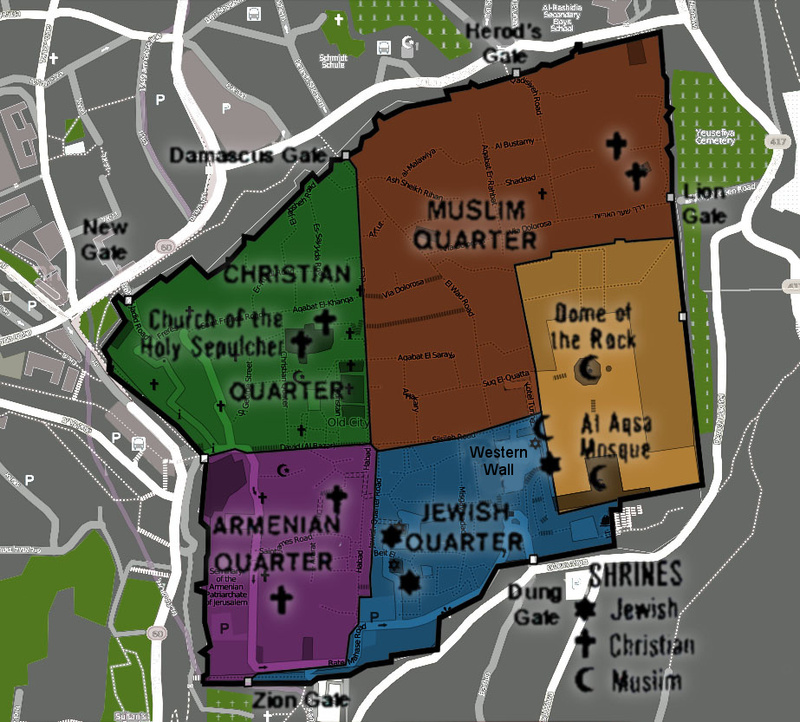 The Old City of Jerusalem is divided into four quarters: Jewish, Armenian, Christian, and Muslim. On his trip Rick spent a week in Israel and a week in Palestine. He made a point of talking to locals on all sides of the hot‐button issues that make the situation so complicated. To many, Israel represents a beacon of democracy, stability, and prosperity in the middle of a bunch of very troubled states.… To others, its very existence is an offsense against groups who were displaced after living here for centuries. As with everything here, it all depends on which people you talk to. There is no denying that the Israelis built a nation of abundance. They converted desert into including lush valleys that support agriculture. The city of Tel Aviv was just a big sand dune in 1908. All Jewish Israelis go into the military at age 18, women for two years, men for three. Protecting their land and their freedom when surrounded by enemies is of paramount importance, but the universal draft also builds social cohesion. For a country that welcomes all Jews with its “Law of Return” policy, this military service ensures new arrivals are appropriately assimilated into Israeli culture. The “Law of Return” has resulted in the displacement of Paslestinians. Entire villages were plowed under to make way for forests and parks to benefit the growing population. These new arrivals are welcomed “home” like royalty, though they have no connection with Israel at all. And families who have lived there for thousands of years are uprooted and forced to leave. Israelis, for the most part, want peace and security. They have a long history and strong racial memory of being welcome guests in foreign lands—until they were no longer welcome. I think it’s understandable that they want to maintain a strong defense against hostile neighbors. Beginning in 2003, Israel constructed a wall, 300 miles long, separating Israel from the West Bank. They call it the “Security Fence” or “Anti‐Terrorism Barrier.” Palestinians call it the “Separation Wall” or “Apartheid Wall.” Israel insists the wall is necessary for the protection of its citizens, and statistics bear that out. There have been fewer suicide bomb attacks in Israel since the wall’s construction. Palestinians insist that the wall (which is as yet unfinished and is not effective in keeping anyone from crossing) isn’t the reason for the decline in violence. Rather, they credit a shift in philosophy on the part of the Palestinian people, who have realized that violence is a losing strategy in their fight for freedom. In addition, they point out that the wall runs within Palestinian territory and is gerrymandered around Israeli settlements on the West Bank, around aquifers, good farmland, and important religious and agricultural sites. Rick points out that one of the wall’s (possibly intended) consequences has been to separate people and cultures. “I sensed that the younger generation on both sides wanted to get beyond the baggage of their parents and connect. But with this barrier, there’s literally no common ground where people from opposite sides can come together. Walls … may be necessary at times, but they represent a diplomatic failure.” He also describes how Israel has encroached on Palestinian land by building new settlements on the West Bank. The government subsidizes housing and transportation costs for Jewish families who reside in these settlements and commute to jobs back in Israel. History has taught us that when a government plants its citizens in disputed territory, the descendants of those original settles are likely to pay the price. Ultimately, rather than cheap, that land is very costly.…These Israeli enclaves embitter the Palestinians as much as violent resistance embitters Israelis. And the more settlements are built, the more the West Bank becomes fragmented, and the more difficult a mutually agreeable two–state solution—or any solution—may become. It’s hard to imagine the last two of these being appropriate and acceptable solutions. And it’s perhaps even more difficult to foresee the first given the current hostilities that exist. That leaves the status quo. Sadly, I think this is untenable in the long term. But I just don’t know how we get from here to there, whatever “there” is. And here’s where my point of view gets to be controversial. If the Jews have the right to the land they now occupy in the Middle East, then the Native Americans ought to have the same rights to the land in North America that was usurped by European settlers and colonists. The idea that there is some special biblical dispensation that awards land rights in perpetuity is nonsense. The Jews should never have been provided a homeland in the Holy Land. This is one more case of dominant white people deciding that they have some special privilege to decide everything about the world and impose their decisions on people of color. As a Jew, I’m ashamed of the way the Israeli government is treating its Palestinian citizens. But there is Israel, and it’s not going away. (Also, here is the USA, and it’s not going away.) So what’s the solution? I don’t know. Start, though, by respecting the rights of all people to live free and to choose their path.